The Spa at Silver Legacy offers an unrivaled relaxation experience. Every detail of The Spa—from the style and intimacy of our spa treatments, to our custom-mixed scents and carefully selected color palettes—is designed to soothe the soul and delight the senses. In the eloquent words of Spa Director George Powell-Lopez, "It is a metaphysical odyssey, allowing the conscious mind to recognize eminent beauty while the subconscious mind encounters a new level of repose." A luxury spa experience is sometimes made even more special and memorable when shared with a loved one. Give the gift of Reno's premier spa. Design and print instant gift cards for any occasion. 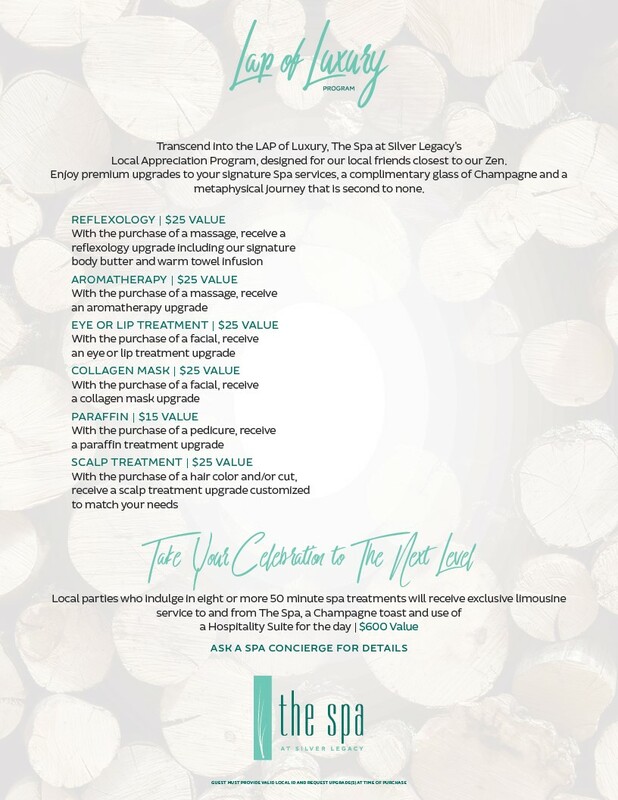 Transcend into the LAP of Luxury, The Spa at Silver Legacy’s Local Appreciation Program, designed for our local friends closest to our Zen. Enjoy premium upgrades to your signature Spa services, a complimentary glass of Champagne and a metaphysical journey that is second to none.